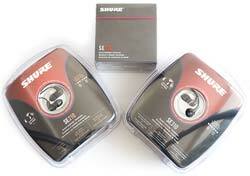 So adding to my work load is Shure’s new SE range of canal earphones. I have managed to get my grubby hand on the SE210, SE310, and the top of the range SE530. This new range is a progressive update to the existing Shure earphones, the technology is similar but styling and sound signatures are new! The reviews should be posted up in the next couple of weeks, with lots of photo’s and opinion. Before that you can look forward to my Westone UM2 review, which should be up in the next few days. Sadly you will have to wait 2 weeks for my full review as I am away on business. However I can say for me Se210 and Se310 have been dissappointing – I would say at the current Se310 price point go for the E3c’s. If they were at the Se210 price than the Se310 do have a slight edge. I am currently trying the SE210’s and SE310s side by side. Don’t know anyone else who’s tried both, so would be very interested in your opinions on the 310. I’ve been listening mainly to acoustic, live flamenco, clasical, Carpenters, Leonard Cohen, Neil Young (plenty of vocals) and Page & Plant and am having a hard time in deciding which phone to keep. They’re very similar in SQ, and so far I feel that neither one of them is well-rounded enough to suit all musical styles. I think the 210 has a ‘fuller’ sound than the 310 which makes it feel more musical. The 310’s are more detailed than the 210’s but sound less musical to my ears. I’m going to continue comparing them, but in the meantime, Tarkan, which one would you choose if they both cost exactly the same? SE210 is finally up, SE310 should be up by the end of this week. So do I 🙂 , I like to try and listen to each earphone over long periods of time and sadly time has not been there to do that. Hopefully the reviews should be ready in a week or so. Where’s the reviews of the Shure earphones?